We carry out secure paper shredding and document destruction services across a wide range of industries from small SMEs and private households through to large blue-chip organisations. With hub centres throughout the UK, we're here to help. On-site Paper Shredding & Secure Document Destruction ServicesFor questions and advice or to get a free quote, call us on 0800 181 4106. 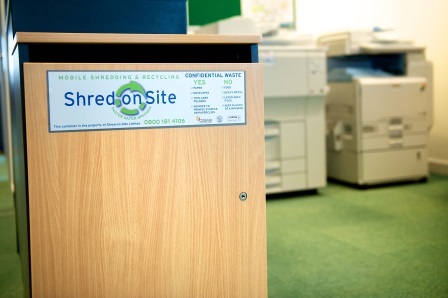 Welcome to Shred-on-Site, the UK’s leading independent paper shredding and on-site document destruction company. We specialise in secure, confidential document shredding services. As principle members of the BSIA we've built a reputation for exceptional customer service, delivering unrivalled value for money through our highly trained personnel and state of the art technology. We carry out secure paper shredding and document destruction services across a wide range of industries from small SMEs and private households through to large blue-chip organisations. No job is too big or too small. We serve local authorities and government departments including NHS trusts, both regionally and throughout the UK. Our three processing facilities in London, Manchester and Bicester support branch offices nationwide. It has been an exciting time here at Shred-on-Site this month. Our MD, Adam Chandler has been recognised for his thought leadership in the document destruction industry by becoming the Chairman of the BSIA (Business Security Industry Association) Information Destruction Section. So much of business rests on reputation and brand image. A good brand image is difficult to achieve and astonishingly easy to lose. Once a negative image is acquired then profit margins will be directly affected. A security breach will smear your efforts and leave you stumbling to pick up the pieces. If you want to attain new; and preserve current business, you will need to appear as a secure solution. Secure document destruction will minimalise the risk of security breaches and safeguard your brands image. The world has moved green, but we all need to be doing our part to make it work. So many of us at home are happy to separate plastics and cardboard away from the rubbish bin, but when we get to work those good practices; quite literally go to waste. It’s understandable that in the working environment, where rushing around and deadlines takeover, it’s easy to forget.